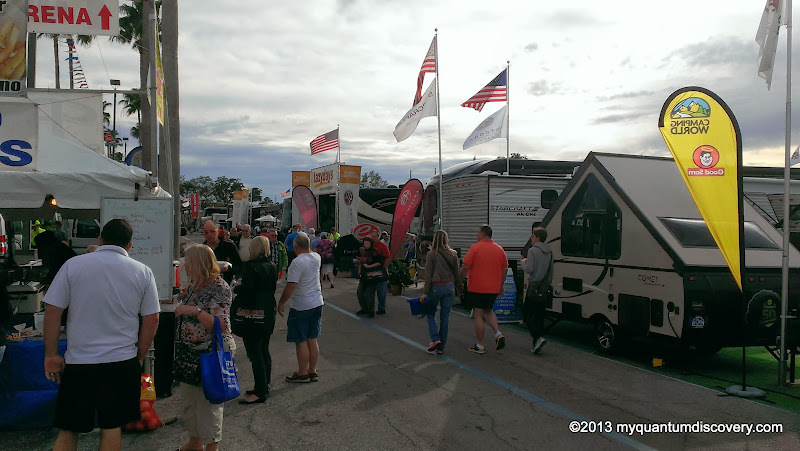 On Wednesday morning we were off and running to the Tampa RV Super Show at the Florida State Fairgrounds. Out of the beast early with a quick stop at a nearby Waffle House for breakfast, we were on our way by 9:15ish. 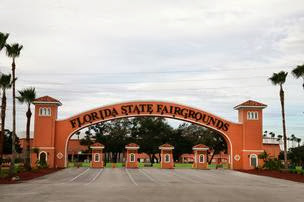 We thought we had probably timed it right so rush hour traffic was over – it was, at least until we were near the exit for the Florida State Fairgrounds. The exit ramp was backed up a couple of miles – we were progressing about 20 feet every 5 minutes. Jeesh, at this rate we wouldn’t be at the show until after lunch time! Our patience wore thin after slowly creeping along for about 1/2 hour then Rob decided to hop back on I-75. Following the instructions so nicely provided by Mrs. Garmin, we took the next exit ramp (no traffic here), driving just a few miles until we reached the back entrance to the fairgrounds. Woo hoo! Smart move by hubby although we were both wishing he had done it sooner. Anyway, we paid the $6 parking fee and were directed to a grassy parking spot not to far from the ticket gate. 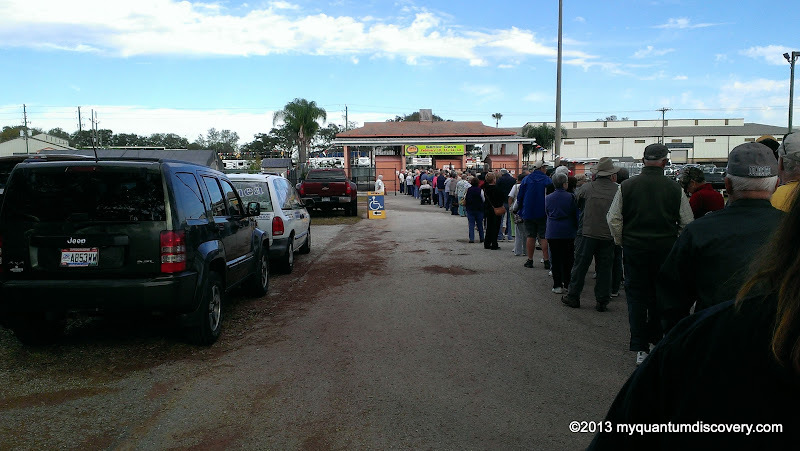 Yikes, there was a line a mile long at the ticket gate! Could it be because all seniors could receive $1 off the $10 ticket price on Wednesday? Or was it because it was the first day of the show? Who knows! Luckily the line moved quite quickly it didn’t take long to get to the front of the line. After paying our $18 for a 2 day pass (we had a $1 per ticket coupon that we found on the State Fairgrounds website) we were instructed to follow the “ugly green wall” to the entrance. Yes, it was pretty ugly and beat up! They had trams running but it wasn’t that far of a walk so we opted to hoof it. It was a little cool that morning because of what seems to be a never ending cold front here in Florida causing freeze warnings at night but it was quite pleasant standing in the sun. At the entrance we picked up our guide and entered a huge building filled with vendor booths. Needless to say, all those people who had been in line were now inside so it was wall to wall people. 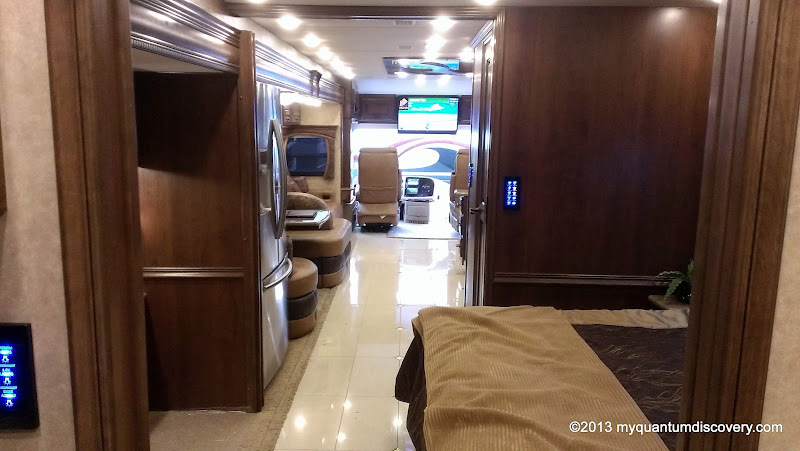 Rob and I have often said that in our next lives we want to come back as an RV owner’s pet! And we said it again at the show – I’ve never seen so many little pooches in strollers being wheeled about by their owners! But there were some others who didn’t have it so good – they were on leashes and actually had to walk – poor pooches! Didn’t see any kitties though! 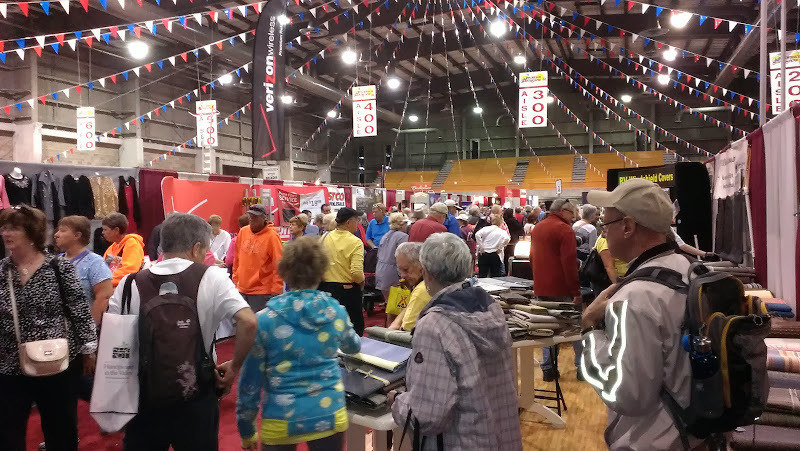 Anyway, there were hundreds of booths with everything from cleaning and polishing products, kitchen ware (pots & pans, knives, etc. 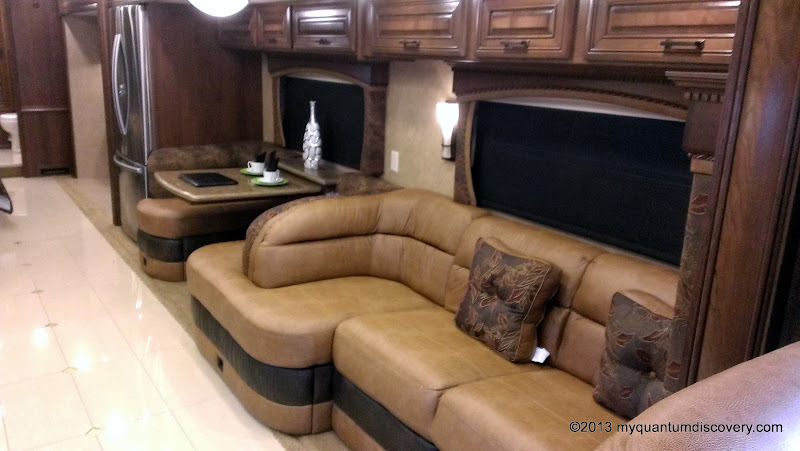 ), RV insurance, water softeners, mattresses, sofas, chairs, pillows, sewer systems, etc. 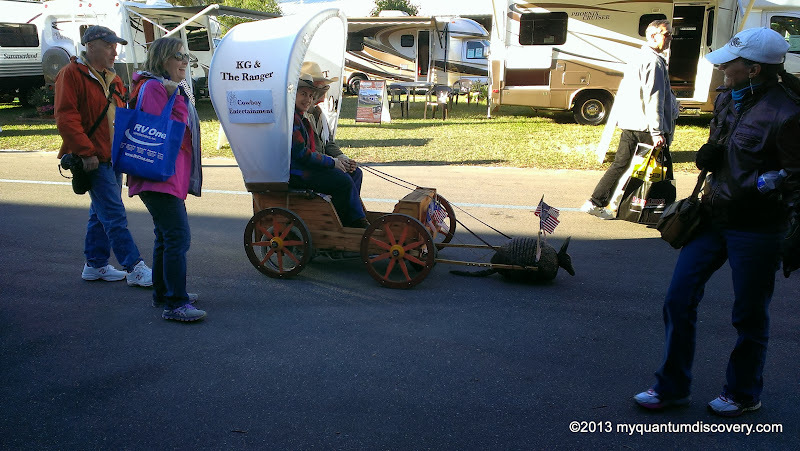 Any product that might work on an RV was being sold there. Having a new coach, I was sure that we would not go back to the coach empty handed. 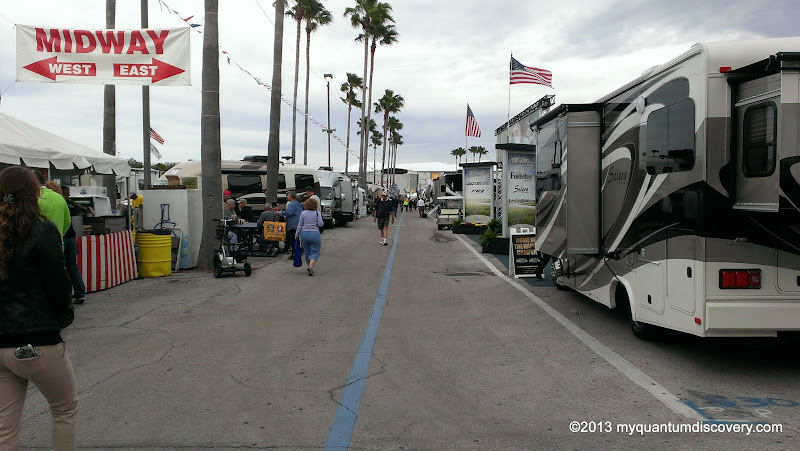 Then of course, there were hundreds of booths with reps from the various RV resorts and campgrounds not only from FL but as far away as Alaska! We were grabbing brochures and business cards left and right and filling out chances to win a free week somewhere! Surprised that we did that. One time we went to a home show in Boston – afterwards we were bombarded with solicitations so at future shows we stopped filling out the chances. However, we used a “disposable” phone number provided by Google Voice so it will be easy to shut that down if needed. And after the show the big question is what do we do with all that paper we grabbed? 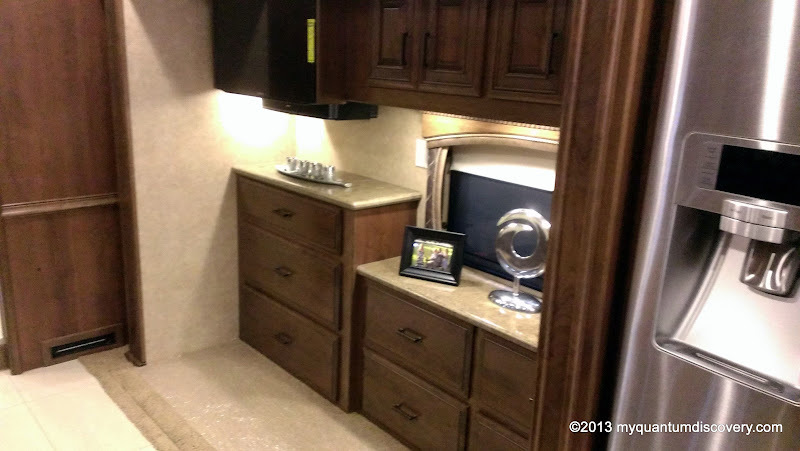 In the house, we would shove the bags of stuff in a closet – don’t have that luxury anymore! Then again we always need kindling for a campfire! After we finished the first building we went outside. 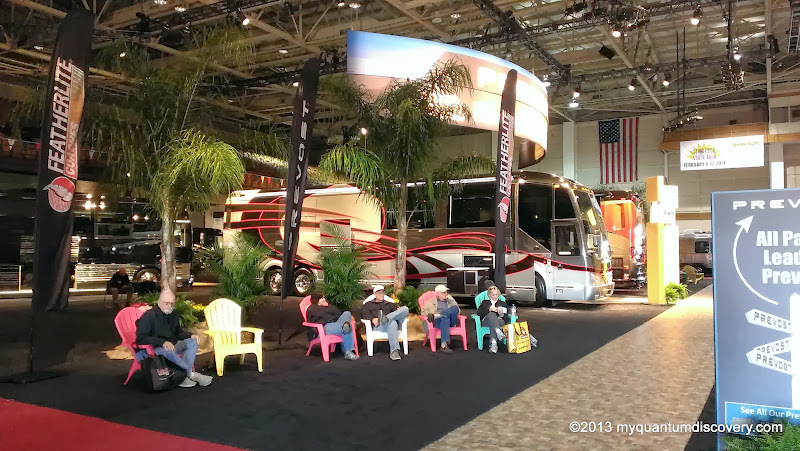 Wow, I don’t think I’ve ever seen so many campers, tent trailers, motor homes, 5th wheelers in one place in my life. 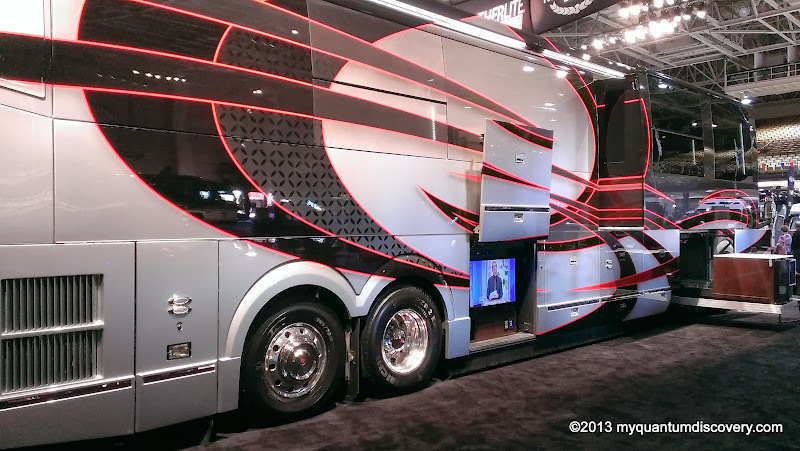 We’ve been to small RV shows as well as good size boat shows but nothing as humongous as this. As mentioned, I didn’t think we would escape without spending some money – we didn’t. 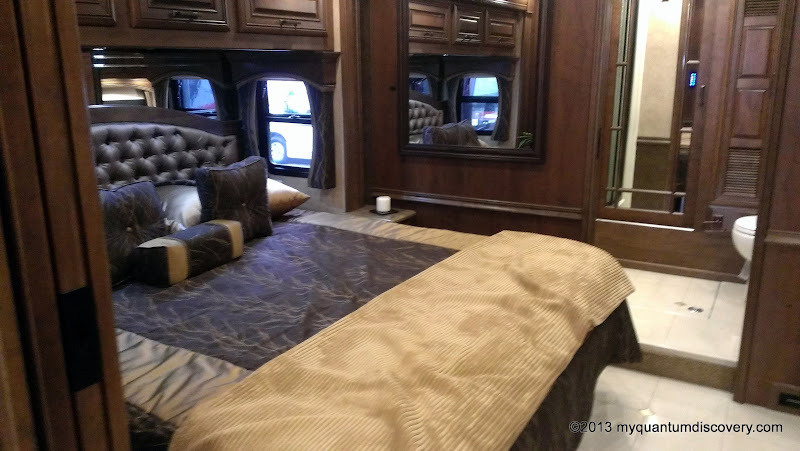 When we had our Fleetwood, we had exterior window sun screens (front and 2 side windows) and tire screens made by Wade RV. For those non-RV’ers out there, these block the UV rays which can hasten the deterioration of your tires and your front dashboard. 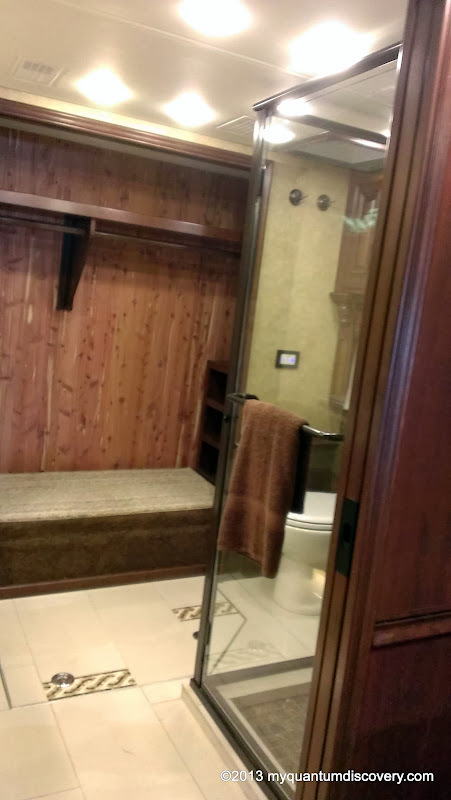 It also significantly reduces the amount of heat that builds up inside your unit. 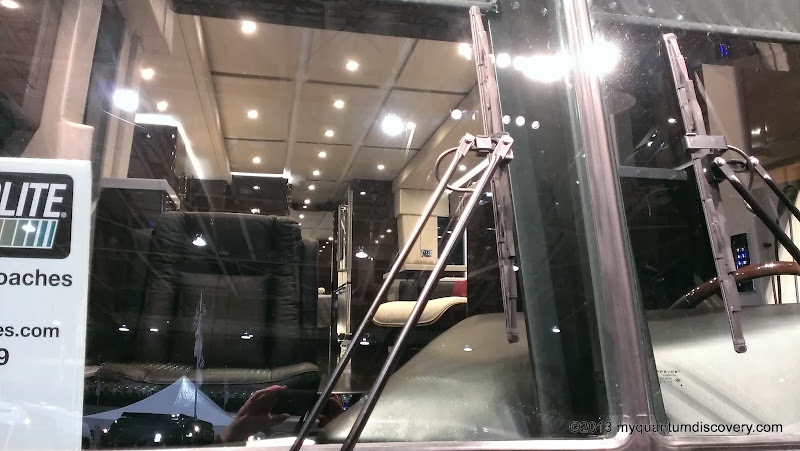 We already have interior sunscreens on all the windows and these help a lot, but still are not as effective as an exterior screen, particularly on the huge front windshield and driver side window. 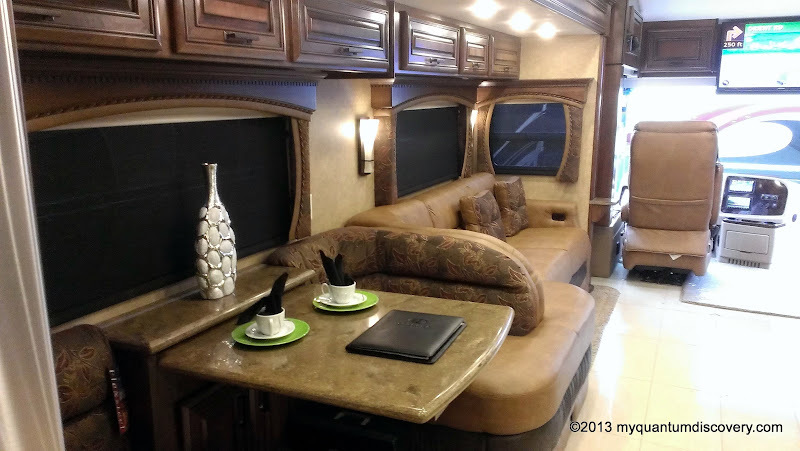 Rob wanted to have new ones made for our Aspire but he didn’t like the fact that to install them, holes are drilled and snaps are inserted into the fiberglass of the coach. 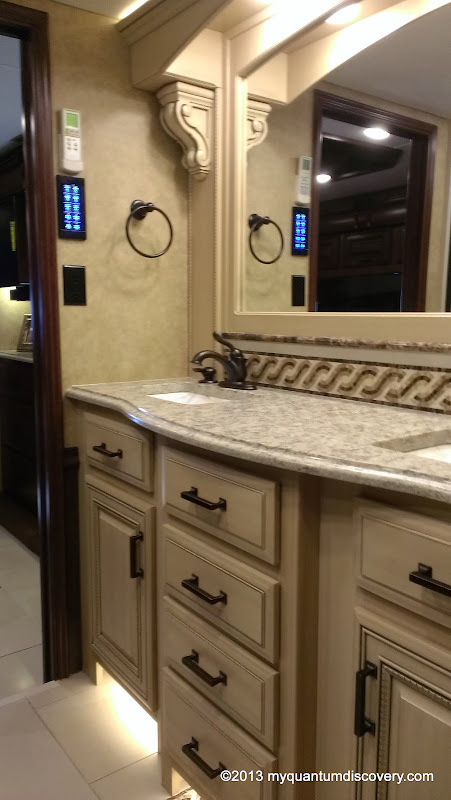 As we were walking along at the show, we came across a vendor, Prompt RV Sunscreens who offers sunscreens for RV’s without drilling holes using their patented Anchor System. After talking to the owner, Bill, and seeing the product we were pretty impressed but we wanted to think about it for a bit before ordering. 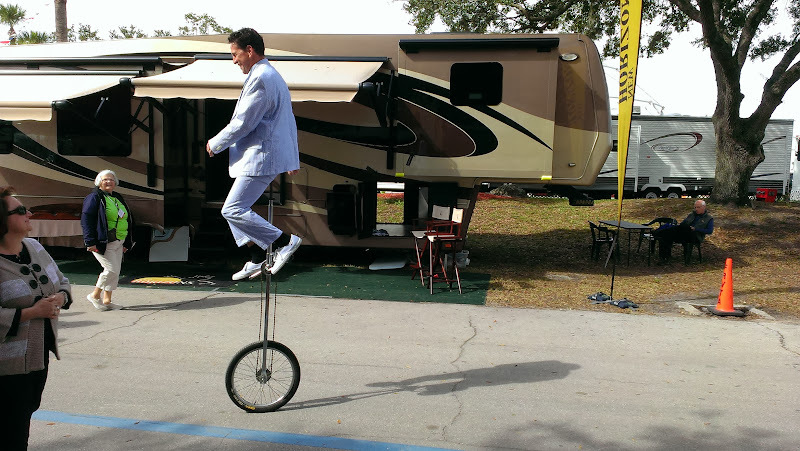 While walking along, we passed a number of street performers which are always fun to watch. Continuing on, we entered another building with more vendor booths. By now the feet were beginning to scream “enough is enough” and our tummies were growling away. Walking through the entire building seemed to take forever due to all of the people (and the pooches). By now, I had started whining. Knowing how cranky I can get when I am hungry, Rob quickly steered us to one of the outside stands and bought me a burger while I sat down at a nearby picnic table. Ah yes, it felt good to sit! 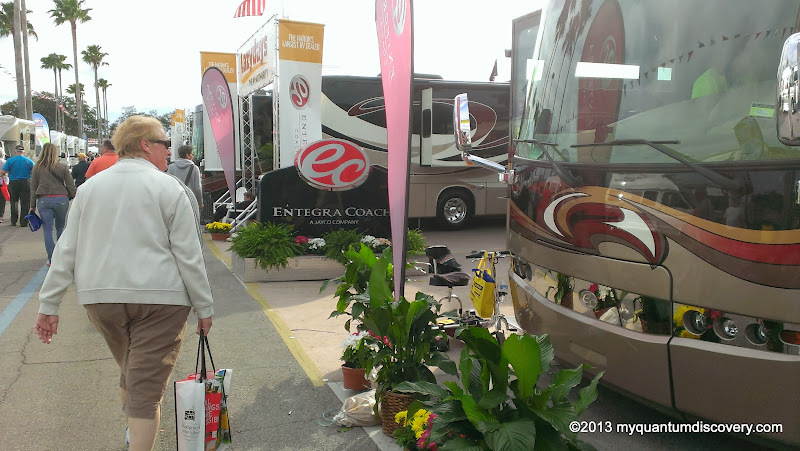 After resting for a bit, we headed over to the Entegra area, passing by rows and rows of other coaches and 5th wheelers. 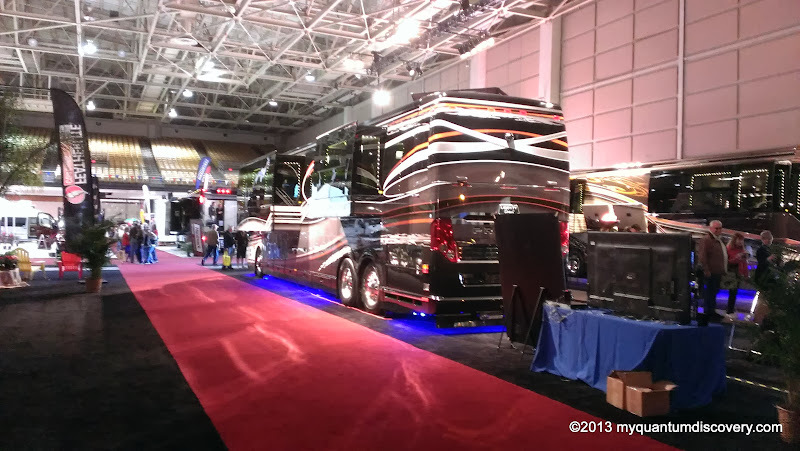 What a job it must be getting all of these motor homes parked! 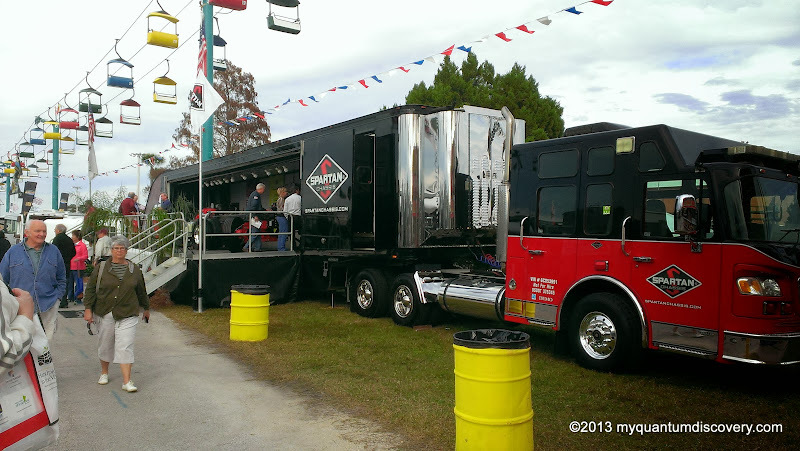 Along the way, we stopped at the Spartan Chassis booth and then found the Entegra area. There were at least 9 Entegras to look at, which is amazing since most dealers sell them before they are even delivered. 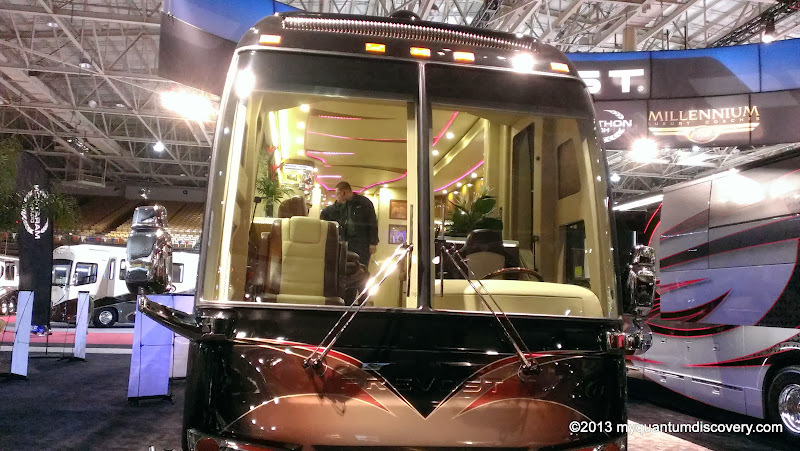 There were 3 Aspires, 3 Anthems, 2 Cornerstones and a brand new prototype, the 39E. Guess Entegra has decided that they need to start competing with Tiffin and other manufacturers in the 38-40′ market. 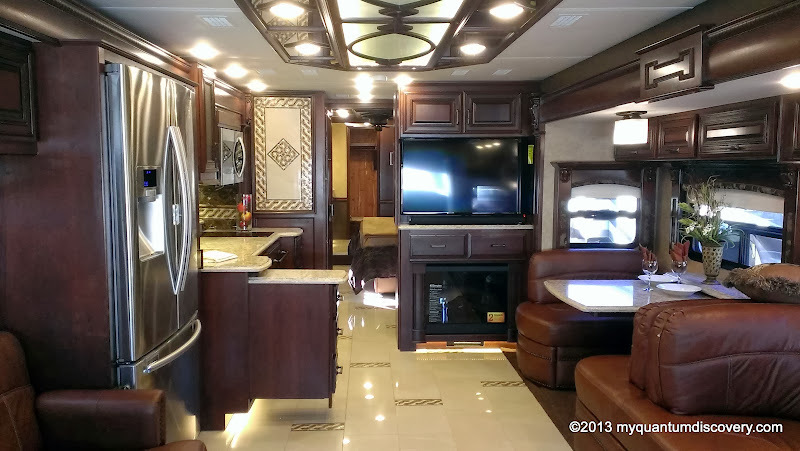 The 39E was a very nice unit on the same 450HP Spartan chassis (minus the tag axle) and with a full wall slide – if it had been available when we were looking, we might have considered it. 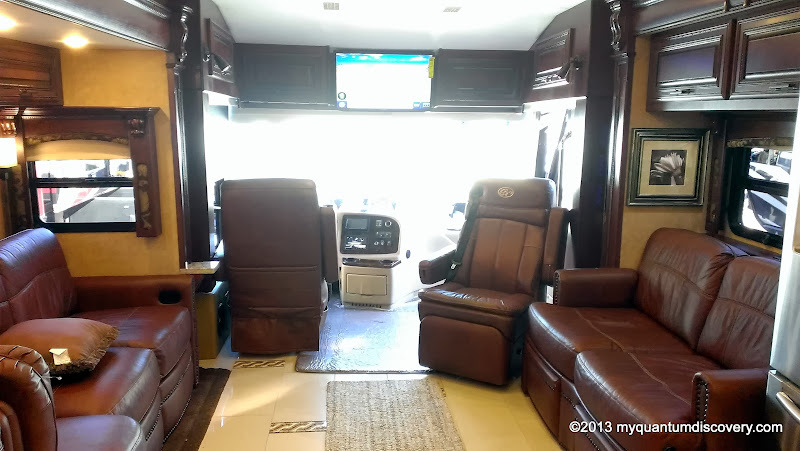 Cargo capacity was just shy of 4200 pounds, impressive for a non-tag luxury coach loaded with tile and solid hardwoods. Another reason for visiting the Entegra display was to see if any major changes or new features had been added on the new Aspire’s. 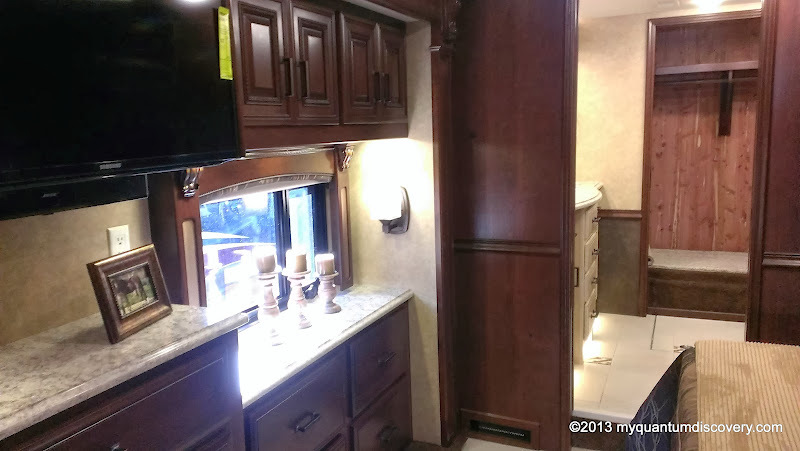 There were a few minor improvements like snazzy new docking and security lights, a split front shade vs. our one piece unit, a new Samsung Convection/Microwave vs. our GE profile and LED lights everywhere (we just have them overhead). On the other hand, the dash compass/temp module was gone as was the up/down remote tilting rear camera – we would definitely miss both of those. It was fun going on board each one and listening to the very positive comments made by people who were seeing an Entegra for the first time. 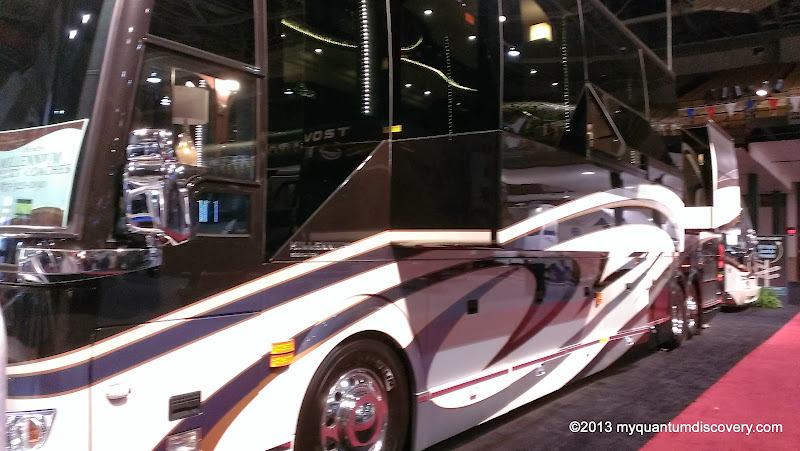 We also went aboard several American Coach (Fleetwood) motor homes. Always interesting comparing features found across the different manufacturers. We have found that there is no “perfect” unit – there’s always something you don’t like or something you wish you had. 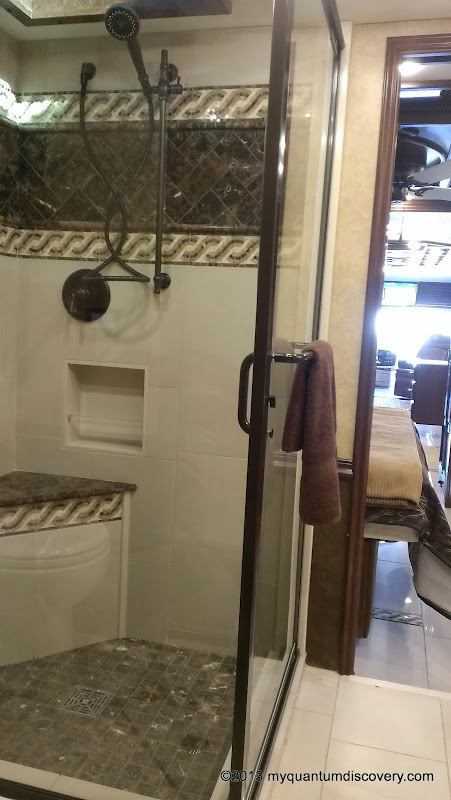 By now, it was close to 5 pm so we started heading back the way we came, stopping at Prompt RV Sunscreen again to order not only a complete set of exterior window screens (front, door and driver side), but also tire screens and mirror and window wiper covers. Since we had such a large order, Bill gave us a good deal. Our order will be ready in 2 – 3 weeks. 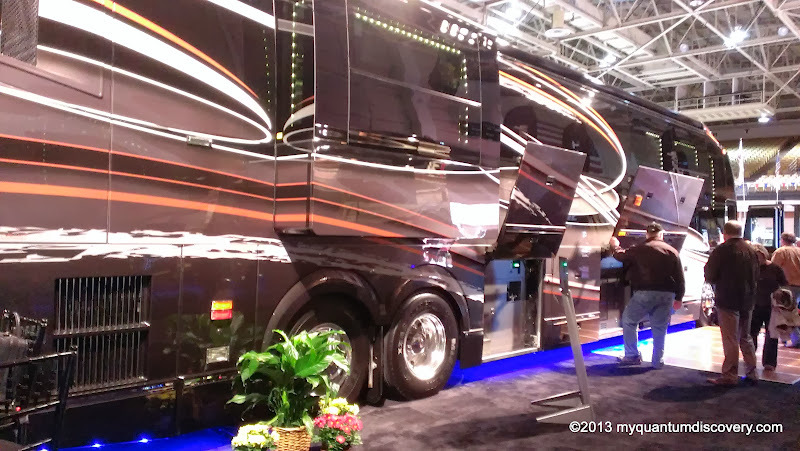 We also stopped by the Wade RV booth to talk to them about a dash mat, or should we say a “kitty mat”. The kids love to hang out on the dash but parts of it are steeply angled and the surface is too slippery for them to get a grip which would result in rapid deterioration of the semi resilient surface. We have a homebrew mat installed now that’s held together with Gorilla tape and velcro – works fine, but doesn’t look so great. To get a custom made mat we will need to go to Lazy Days so they can make a template and then put it together for us. All of it can be done in one day but we haven’t quite decided on this yet. 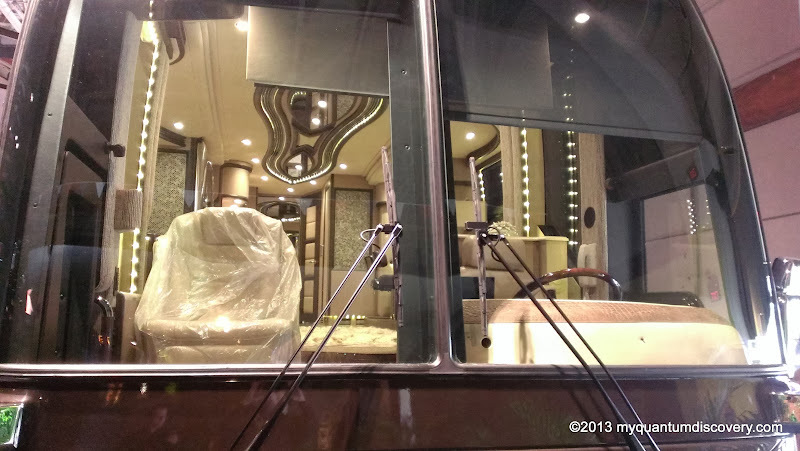 By the time we got back to the coach, it was close to 6 pm – long day to say the least. Quiet evening that night. 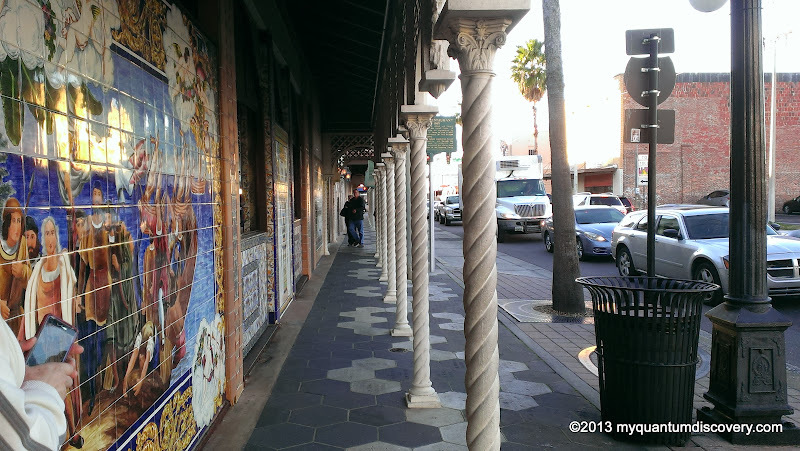 When we left the show we weren’t sure if we would bother going back the next day but the next morning we decided we would head back mid-afternoon since we had the Entegra Owner’s Appreciation Dinner at the Columbia Restaurant in Ybor City at 6 pm. On Thursday we arrived at the show around 2:30 pm. 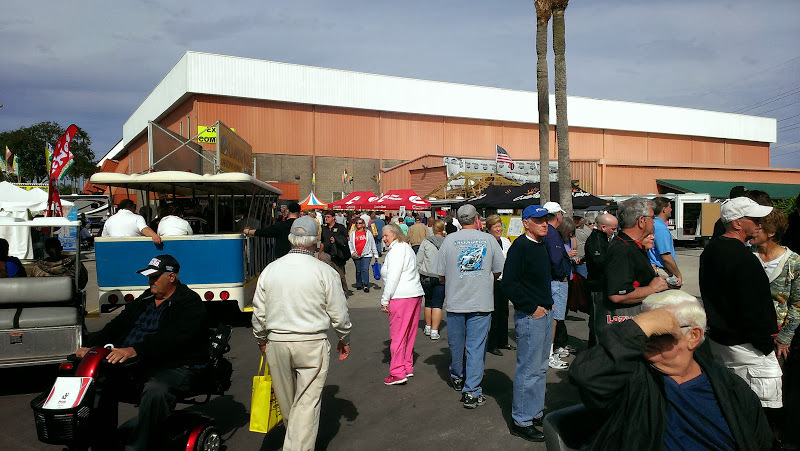 Great time to go, lots of parking spaces and not as many people inside the vendor buildings. 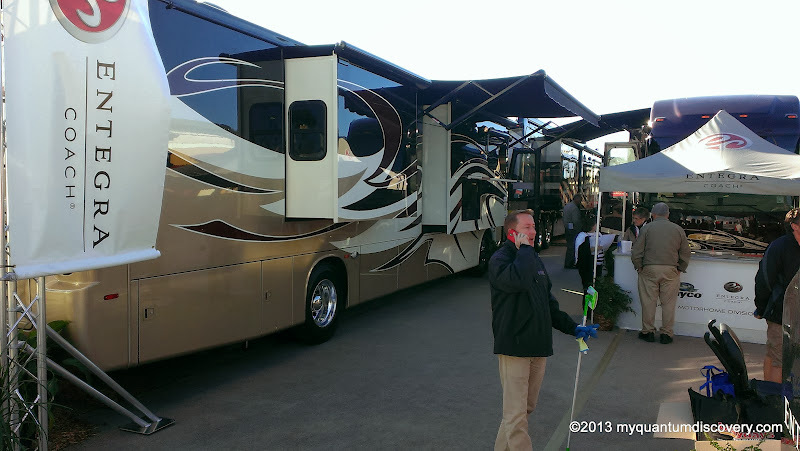 We had ordered our sunscreens in chocolate brown but we realized that we should have ordered the black so it would match our awnings, so our first stop was to tell Bill about our change – no problem. Since we had raced through the second vendor building on Wednesday we decided to go back so we could spend a little more time. On the opposite end of the building, parked outside was a Newell so we went on board after waiting a bit. Unlike other units only a certain number of people were allowed on board at the same time. 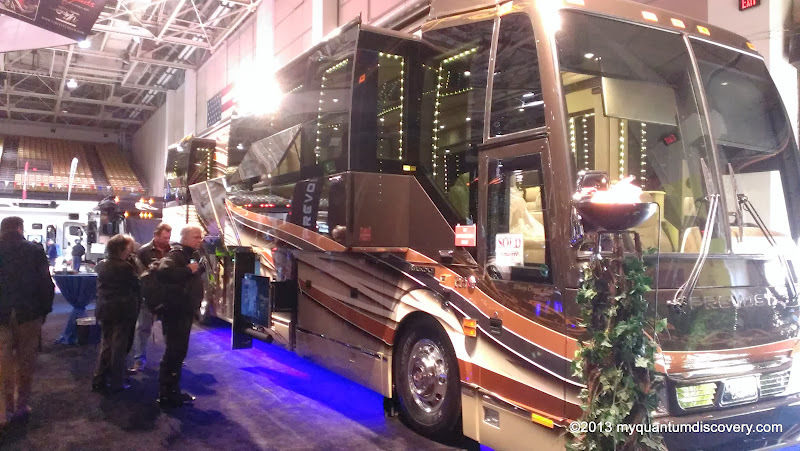 Beautiful coach with fabulous build quality, but this particular one was too contemporary for my taste. Not a problem since we will never be able to afford one anyway! 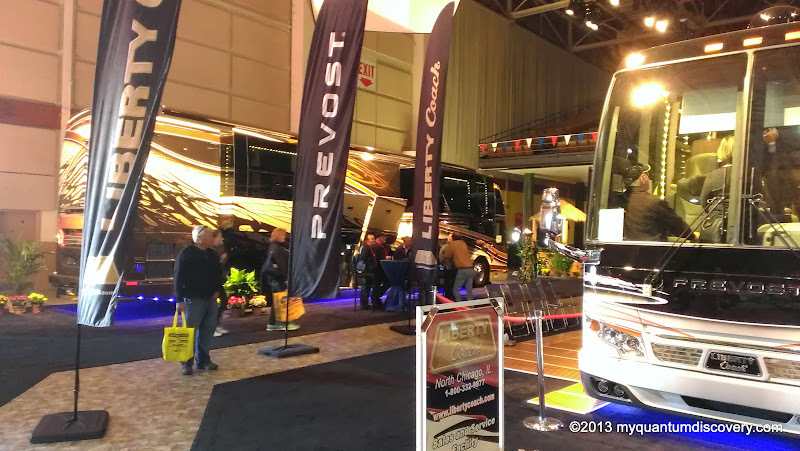 Inside that end of the building were more of the really high end coaches – the Prevost bus conversions and conversion companies like Liberty and Millenium. 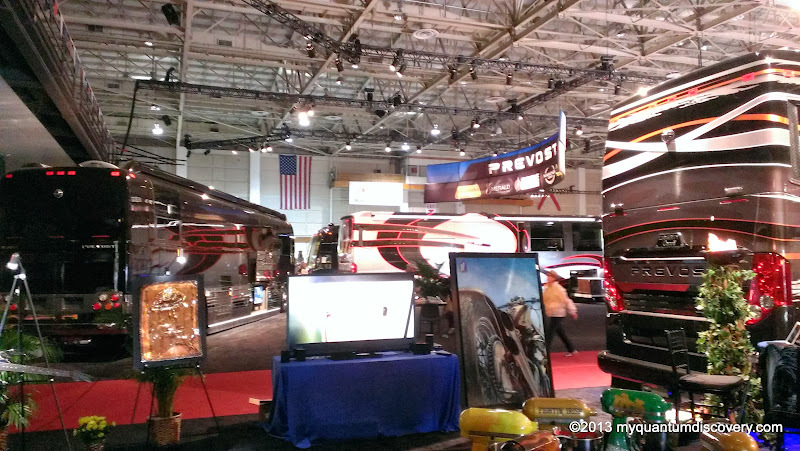 Quite a display area! 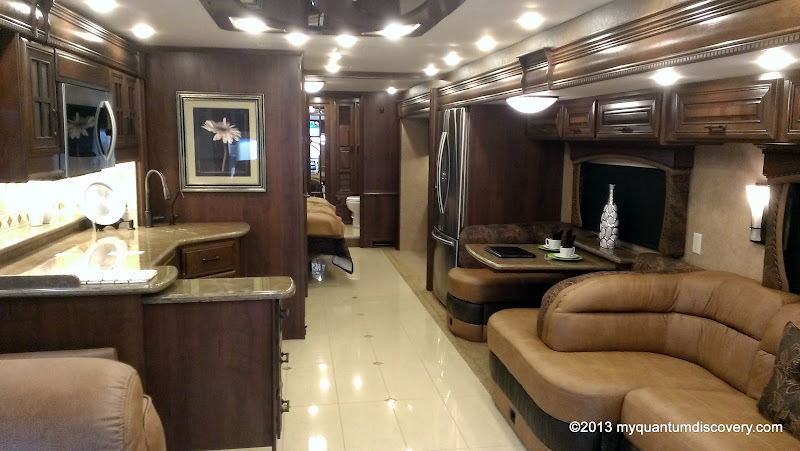 There must have been ten or twelve of these multimillion dollar units. 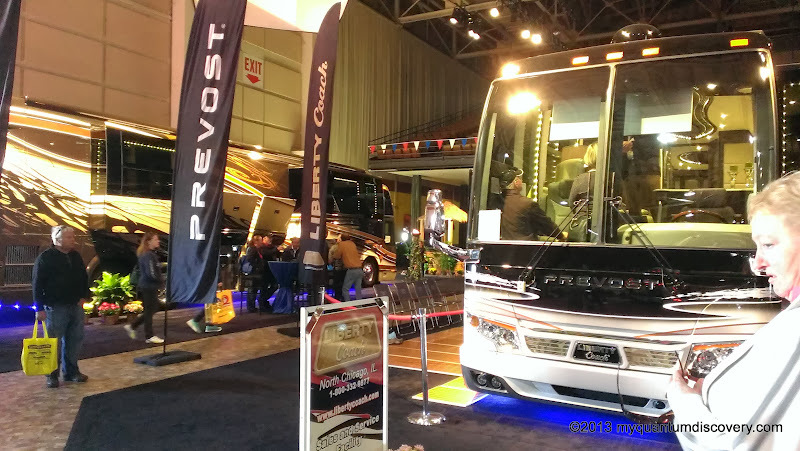 One of the Prevosts had a sold sign on it. Somebody must have made a big commission that day. Unfortunately boarding without an appointment is not allowed but it was fun peering in through the windows anyway. Pretty fancy! 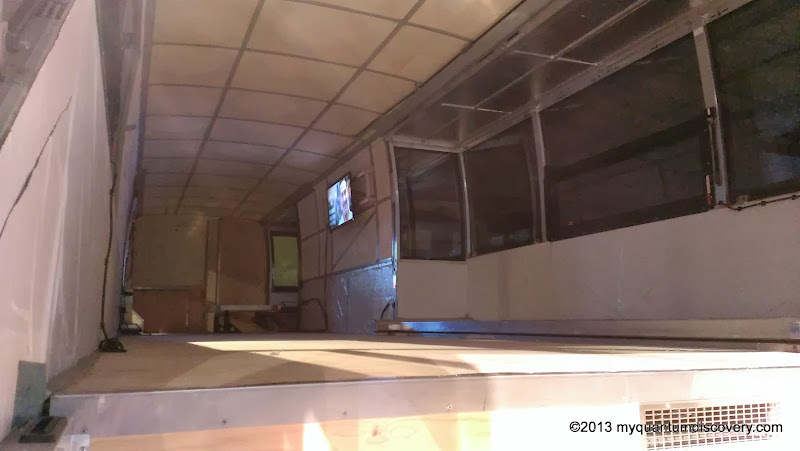 There were even a couple of “empty shell” coaches with no interior which Rob found fascinating. 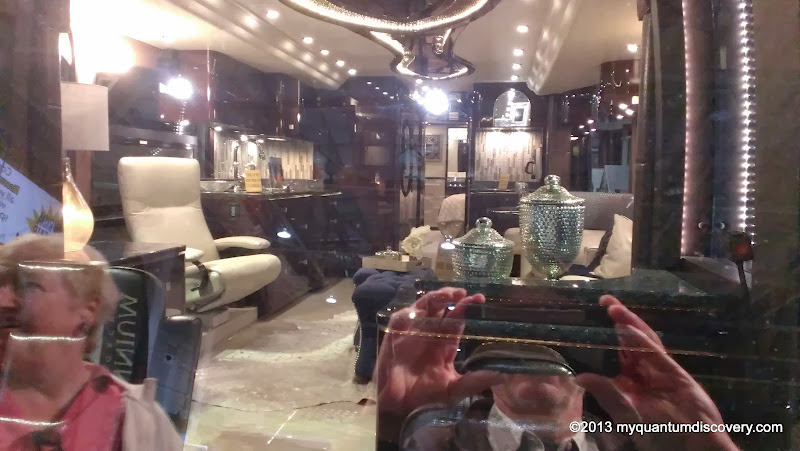 After oohing and aahing over these multimillion dollar coaches, we headed back over to the Entegra area because Rob wanted to take some pictures of the 39E. A shivering Joyce Skinner (the awesome Entegra Director of Customer Service) was there having arrived from Indiana the night before along with PJ, one of the Customer Service techs who Rob works with frequently. It was a little chilly with temps barely reaching above the high 50’s but feeling colder due to the wind. After exchanging hugs and chatting with Joyce for a bit, we decided it was time to head out. 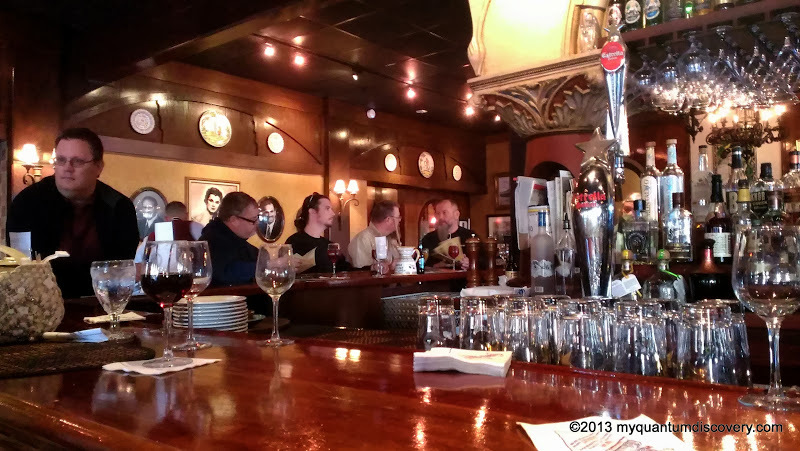 We arrived at the Columbia restaurant around 5:15 but the Entegra dinner was scheduled for 6:00, so we went into the bar to have a drink. 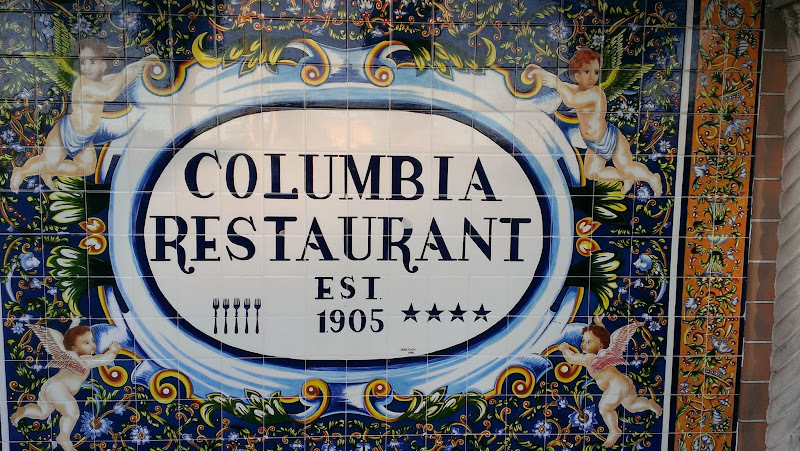 Founded in 1905, the Columbia is Florida’s oldest restaurant and the largest Spanish restaurant in the world. 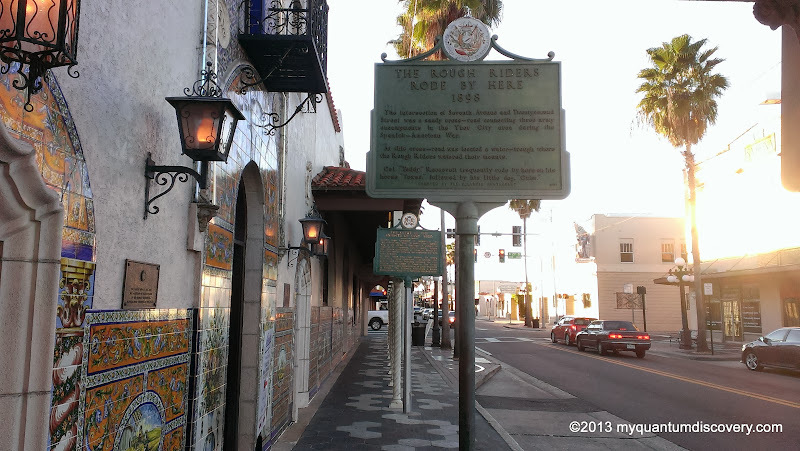 It is located in a very historic section of Tampa,Ybor City which was founded in 1880 by cigar manufacturers and was populated with immigrants from Spain, Cuba and Italy. For well over 50 years, millions of cigars were produced there but during the Depression the area started to deteriorate. 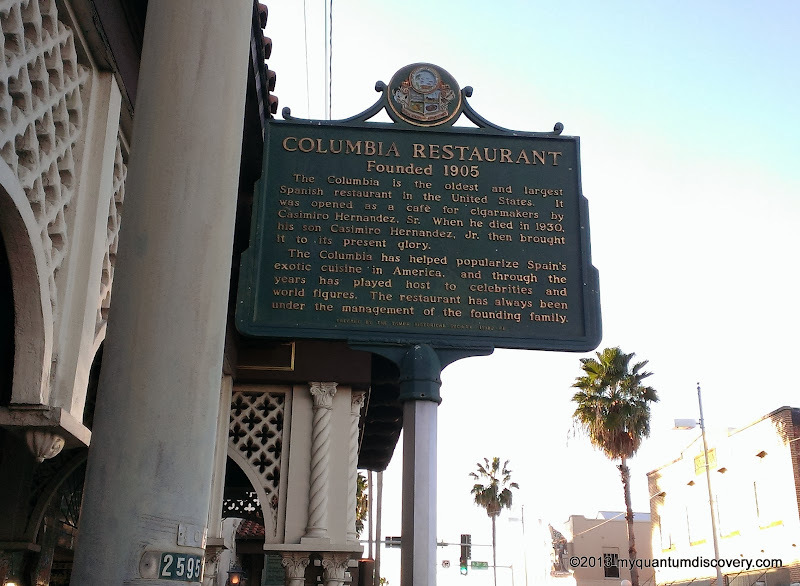 The Columbia Restaurant was one of the few establishments to survive the decline. 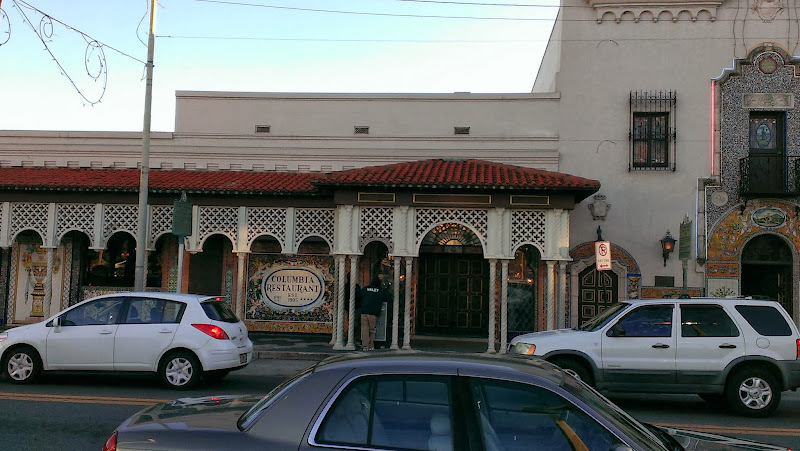 In the 1990’s many of the buildings were converted to bars, restaurants and nightclubs and many of the old buildings started to be converted. Today it is popular destination. Near the Columbia, there is a sign that says that the “Rough Riders Rode By Here in 1898”. It goes on to say that Seventh Avenue and Twenty Second Street was the crossroad connecting 3 encampments during the Spanish-American War. And that there was a water trough located there where the Rough Riders would water their mounts. Teddy Roosevelt would frequently ride by on his horse “Texas” followed by his little dog “Cuba”. 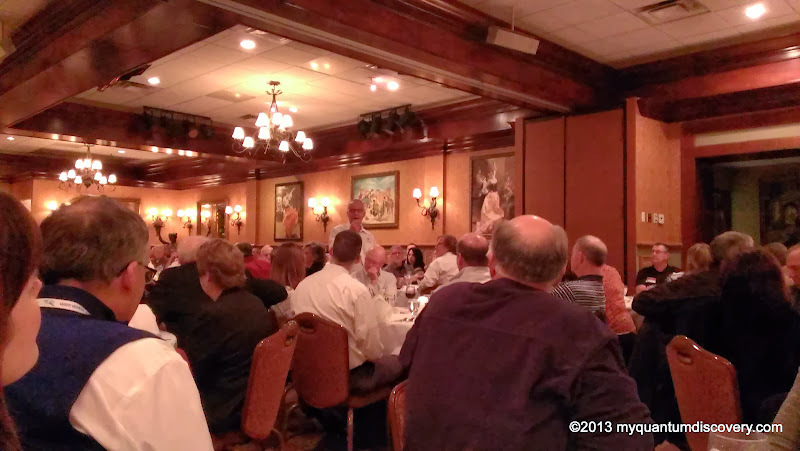 Anyway I digressed into a little bit of history, back to the Entegra dinner. The attendance limit was 200 people so the room was completely filled. A table had been set up with cheese, crackers and fruit on one side of the room and an open bar was set up on the other. After a short speech by Andy Baer, VP of Entegra Sales and Derald Bontrager, owner and CEO of Jayco/Entegra, one by one each table was directed to the buffet table. Food was excellent but since the Columbia specializes in Cuban food, I have no idea exactly what was being served – there were tags next to each dish but all in Spanish so no help there. Even after looking at the on-line menu, I couldn’t identify any of them. All I can say is that there was a rather unique salad, some type of brown rice with chicken, chunks of beef in a sauce and mixed with peppers and onions and shrimp and fish in sauce (good thing it was a the end because everyone was taking their time picking out the shrimp). Dessert was also delicious – some type of very light chocolate cake. 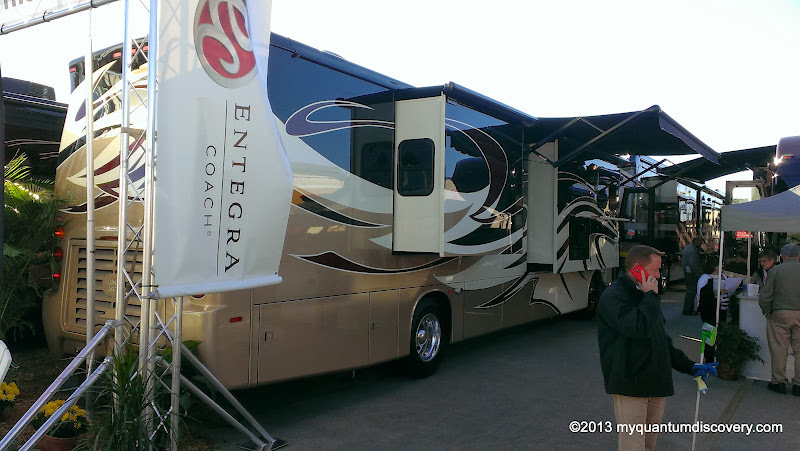 Fun evening meeting other Entegra owners and sharing information about our coaches and the journeys they have been on. By 9 pm, the dinner was over. 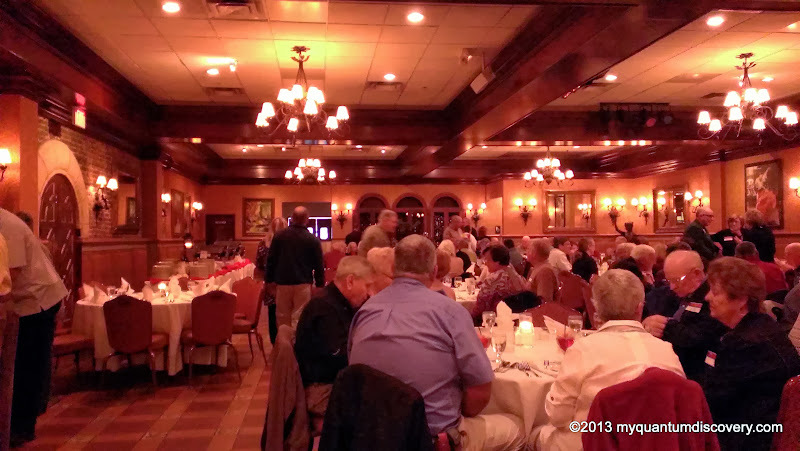 They do these dinners frequently during the year so it is not just an annual event. One couple at our table who have been Aspire owners since 2009 have been to several of the dinners. Before we left we talked for a bit with the couple who just started ECOA (Entegra Coach Owners Association) an FMCA Entegra chapter which we just recently joined. Kudos to Entegra for this wonderful evening! It was great to meet up with Joyce, PJ, Ted, David, Chuck and our other Entegra family members there! Arriving back at Quail Run around 9:45 pm, it wasn’t long before we were tucked into bed.